Wow. It’s only the 5th day since I landed in Morocco, and I have to admit, it’s incredibly overwhelming! So far, I’ve visited 4 cities/towns and just landed in my 5th (Fes) to explore over the next day or so. As you can imagine, we’ve been moving pretty quickly, although I have to say that I’m impressed at how well everything has been organized thus far! I am exhausted, though, and anticipate many early nights in my future on this trip! After departing from Casablanca yesterday morning, we took the train about 2 hours north to the city of Rabat. Rabat is the current capital of Morocco, and one of the four imperial cities in the country (alongside Marrakech, Meknes, and Fes). We were given maps and were told to wander around the city on the hunt for the 3 major sites in the city. First, we stopped at Rabat’s Kasbah (a former royal fortress) made from orange clay located just outside the old medina. I also managed to wander into a small street market surrounded by beautiful blue walls. 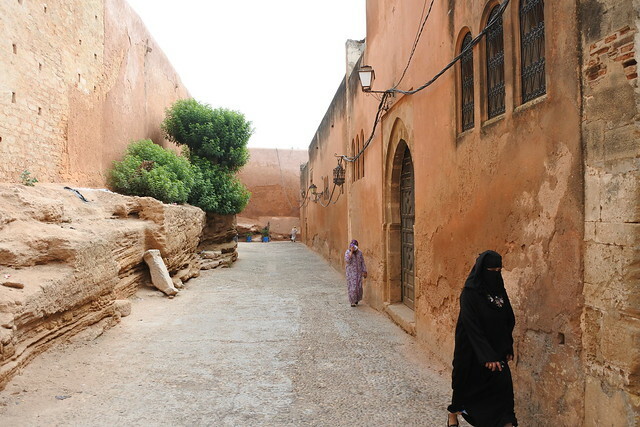 After leaving the Kasbah, I had a wander through the medina, which is a part of the city with small winding streets. The souk is the local market, typically located in the medina, and as Moroccans typically do not store food at home, especially in large cities like Rabat, the market was full of fresh products for the locals to purchase for the day. I loved wandering through my first true Moroccan market to see all of the products on offer, as it was a great glimpse into local life in Rabat. After exiting the hectic market, I walked along the walls surrounding the medina towards a mosque and the Muhammad V Mausoleum . 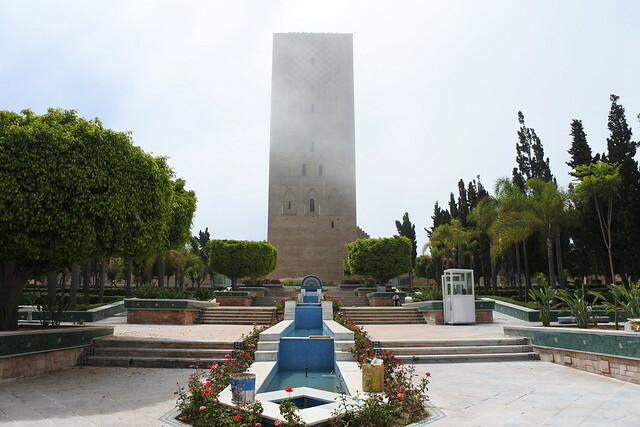 The minaret (tower) of the mosque was meant to be the tallest in the world, but the king died before it was finished and the decision was made to leave it as it was when he passed giving it a unique flat roof rather than the more typically pyramid roofs of many of the minarets in Morocco. Standing behind the mosque and minaret is the Mausoleum where tombs of the royal family are located. 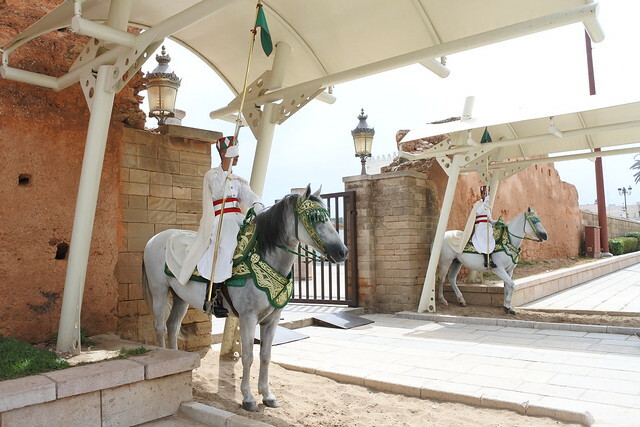 The tomb is still guarded by the king’s guards; two men sit mounted on beautiful horses at the front gate of the Mausoleum, and one stands at each entrance of the tomb, all dressed in the traditional costumes. 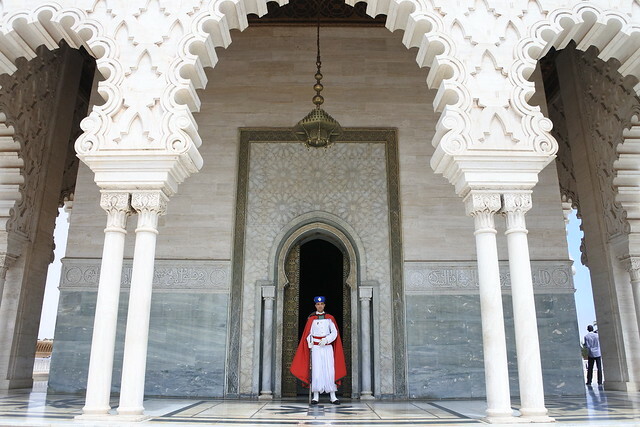 The architecture of the Mausoleum is absolutely beautiful with gorgeous arches and mosaics creating such a peaceful atmosphere. I loved the opportunity to visit this place, as it was much more beautiful and impressive than I was expecting. As we were on a “self guided tour” for Rabat, I do wish that I had more information about what exactly the significance of each part of the Mausoleum is to understand the history and culture behind it. In any case, it was a great start to our first stop after Casablanca! Once we finished lunch in Rabat, we headed on a train towards Meknes where we boarded taxis bound for Moulay Idriss. Moulay Idriss is a small town of about 20,000 people located in the Rif mountains in northern Morocco. The city was originally founded in the 10th century by Moulay Idriss el Akhbar, who was the great-grandson of the Islamic prophet Muhammad. 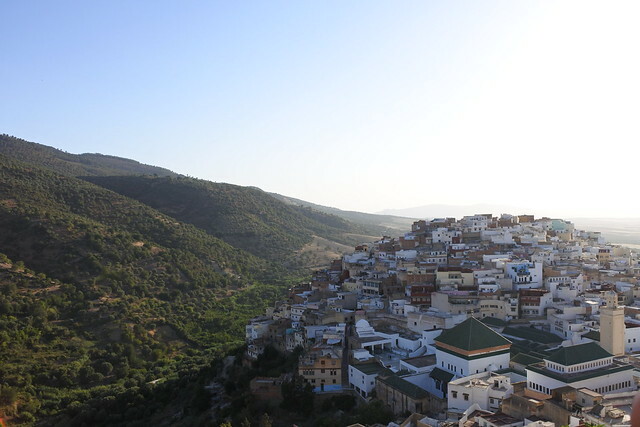 Now, Moulay Idriss is a beautiful little town known as a holy city, as many make pilgrimages to the tomb of Moulay Idriss el Akhbar, who is buried at a mosque in the center of the city. While the mosque is off-limits to non-Muslims (as the town itself was until several years ago), the town was absolutely incredible to visit. The walls along all of the small winding streets were painted a bright turquoise blue color which made everything look incredibly beautiful. 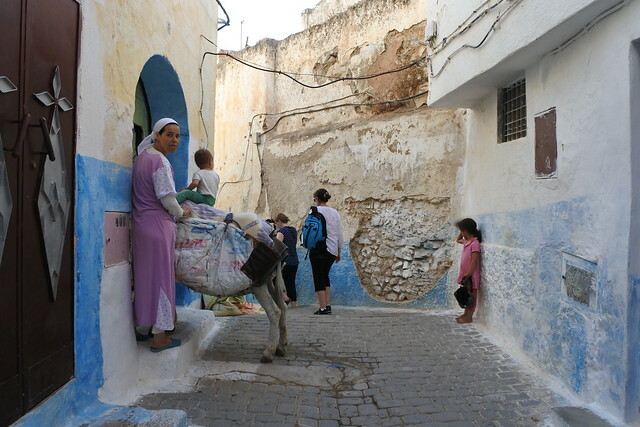 We took a short tour with an incredible local guide to learn about Moulay Idriss, both the town and the man, and to learn more about small Moroccan communities. I truly enjoyed the opportunity to walk around this small, isolated town with someone who had grown up there, as it was an amazing opportunity to really truly understand the local culture. At the end of our walk, we were brought to a viewpoint over the town where we could see the roofs of the entire town, including that of the beautiful mosque, right as the sun was beginning to set. 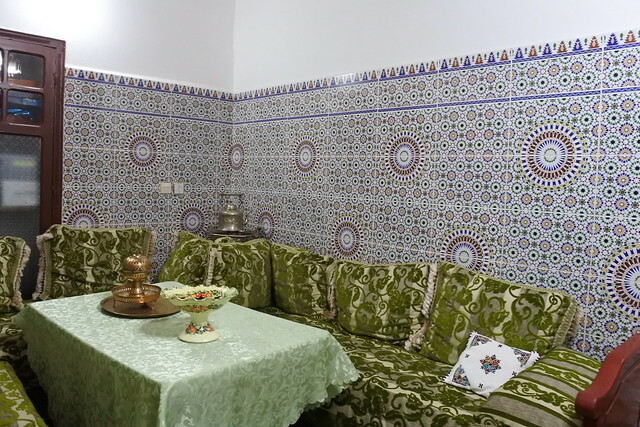 We were staying with a local family in their Riad bed & breakfast in the town of Moulay Idriss called La Colombe Blanche. The hotel is perfectly located and run by an awesome family who were incredibly warm and welcoming. After watching the sun set over the hills from their terrace, we had a lovely dinner at their home where we learned to cook traditional cous cous (much more difficult than it seems), and then ate kefta (meatball) tangine and cous cous around a family-style table. This was an amazing experience, as clearly so much effort had gone into preparing the meal and it was lovely to learn more about the people traveling with me, as well as Muhammad, our guide. Plus, the interior of the home was beautiful! I highly recommend a stay here if you plan to visit Moulay Idriss- and be sure to order dinner from the family, I have never had more delicious cous cous! The next day we made our way back to Meknes with a pit stop at the nearby Roman settlement Volubilis. Volubilis was a massive Roman settlement, one of two in Morocco, but was unfortunately largely destroyed by an earthquake in the late 18th century. Still, standing essentially alone within these ruins was a very surreal experience. The settlement is surrounded by rolling hills, and seemed to go on for miles. 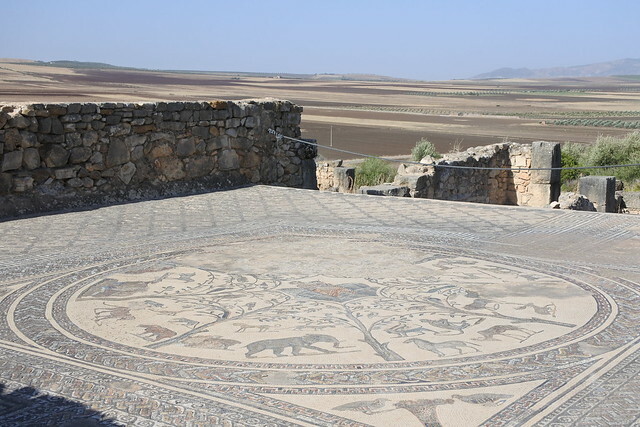 We were able to walk through some of the massive houses that were owned by wealthy families in Volubilis, complete with gorgeous mosaic “carpets” which still lay as they were on the floors of the individual rooms. We were also able to walk through the forum, and then the cathedral which has no walls or roofs, but still has massive and beautiful columns outlining where the structure stood in its time. 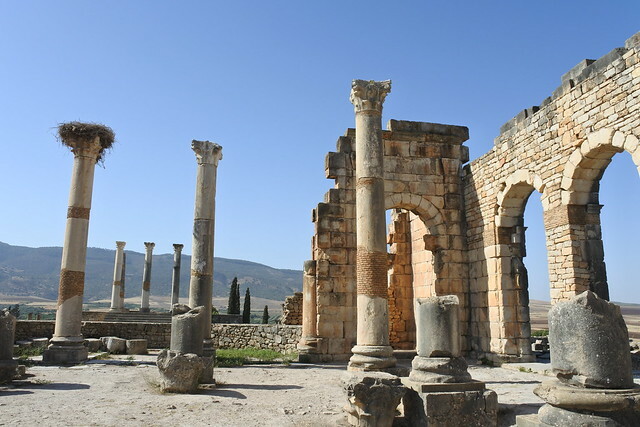 A visit to Volubilis is definitely worth putting on the itinerary of a North Moroccan trip, particularly if you will already be visiting Moulay Idriss. It’s possible to get a taxi or local guide to take you to Volubilis from Moulay Idriss, and the prices can be quite reasonable (after haggling, of course!). 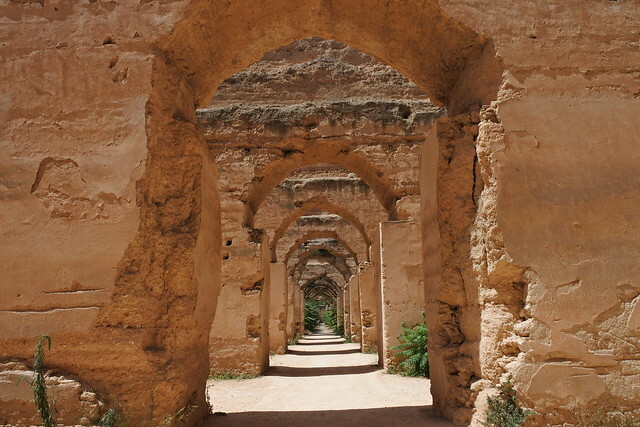 After departing from Volubilis, we made the 45-minute journey back to the town of Meknes to visit the ruins of the palace created by King Moulay Ismail, a contemporary of Louis XIV of France. King Moulay Ismail was well known for trying to create structures and a kingdom just as amazing as those created by Louis XIV, and so what is left after the same earthquake that destroyed Volubilis is still absolutely incredible. The most note-worthy structure is the stable which was built to house 12,000 of the king’s horses. After visiting these ruins, we stopped in the medina for a camel burger before heading on to our next stop in Fes. 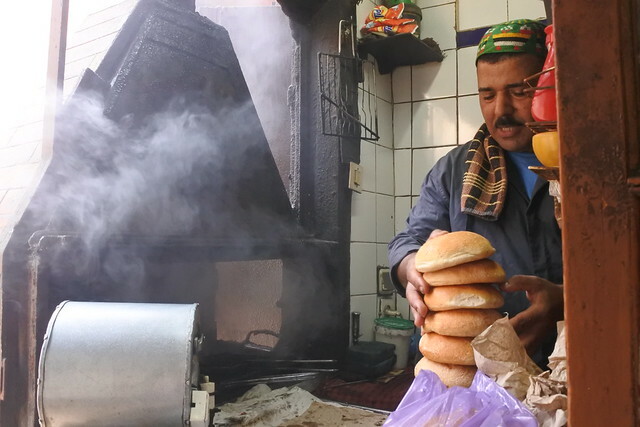 Camel burgers are rarely consumed in northern Morocco, as the meat is quite expensive for the locals and you won’t see many camels in the area, but there are still a couple of (very) small restaurants that are willing to prepare them! Overall, I loved this part of the trip as these were places I might not have thought to go to on my own. I would especially recommend a visit to Moulay Idriss and Volubilis, as they’re very remote but truly incredible pieces of Moroccan history and culture that would be difficult to find in other places in the country! 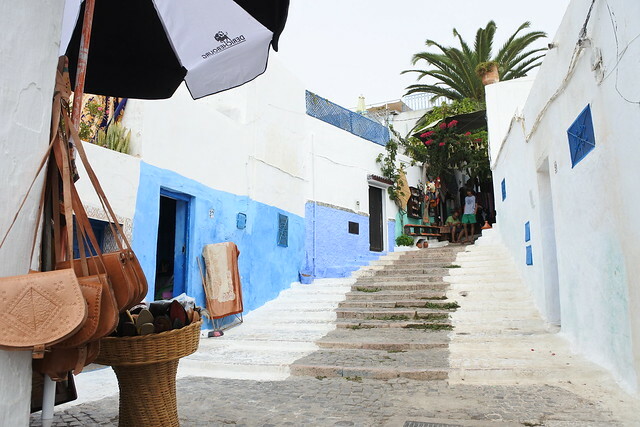 Up next: Fes and Chefchaouen (the Blue City)! Remember to follow me on Facebook, Instagram, and on this site to hear the latest about my Moroccan travels!